Did you know that chickens have different alarm calls for different predators? 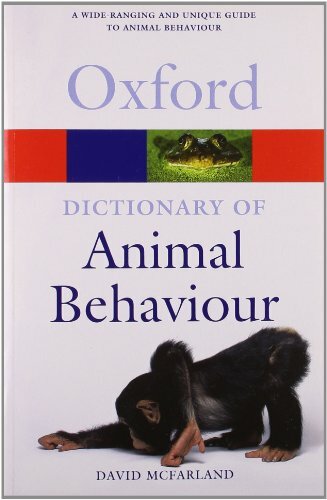 This fascinating dictionary covers every aspect of animal behaviour and includes terms from the related fields of ecology, physiology and psychology. Clear, concise entries are backed up by specific examples where appropriate, covering all aspects of behaviour from aggression to courtship, and fully cross-referenced. The author, David McFarland, was formerly head of the Animal Behaviour Research Group at Oxford University, and the editor of the Oxford Companion to Animal Behaviour (1981). Jargon free and informative, this dictionary is an excellent source of reference for students of biology and psychology, and essential reading for naturalists, bird-watchers, and the general reader with an interest in animal behaviour.